thanks so much for your kind reply, Magnus! Adam! You're not forgotten ! Or rather you were but Aeroscale sent me a mail that you were back posting in your old thread ! To be honest, I think you disposed of these in a clever way, start over with something new now almost a decade later! 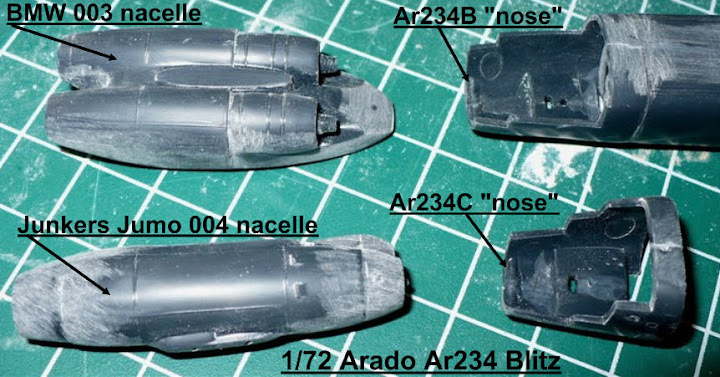 SO these old 1/72 braille-scale LW relics are in various stages of incompleteness or have vanished. Life happens - my only excuse! Many of these planes became classroom "incentive projects" that I had students finish with me. The kids got to take them home when they were completed. Personally, I am so cluttered with UFOs (Un-Finished Objects) that it is pretty embarrassing! So I do thank you all for your kind words of support. I will return! Friends, all work and no play means no time for a hobby - or internet! Enjoy the viewing of an incredibly undetailed 1967 Lindberg He 219! so, what happened to the Arado, you ask? 3. Night fighter variant - Ar234 C-3? 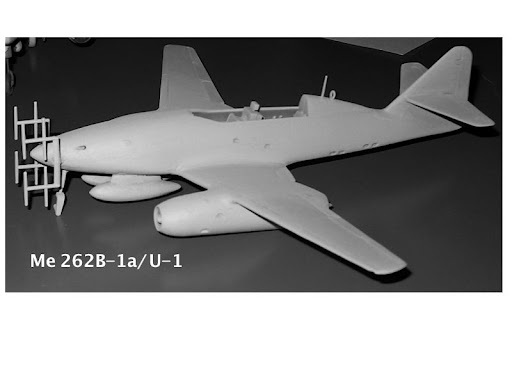 C-3/U-1a? something Luft '46-ish....the antennas have yet to be fabricated!! 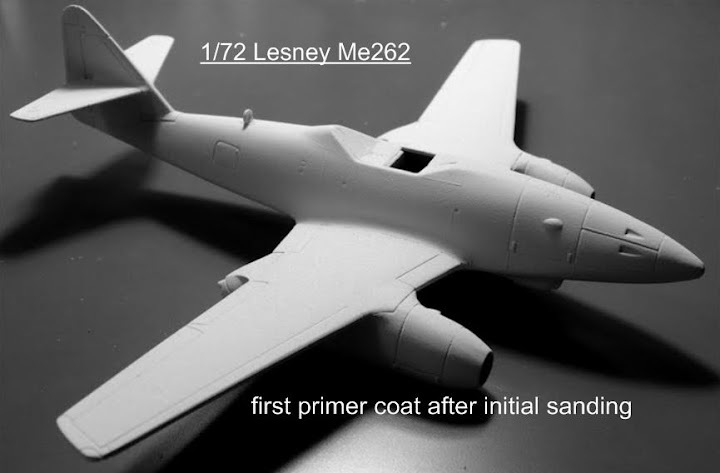 Here is a screenshot of the remaining details to attend to on most of the 1/72 aircraft I am building at the moment. I have labeled my "to-do" list for these little mini-Luftwaffe flugzeuge!! You asked - where did the Airfix FW-190D-9 go? The Dora - in 1/72nd - will likely fall into place last. Don't know if you recall, but I did have a nearly completed 1/32nd Dora 9 Hasegawa also awaiting paint - yikes! 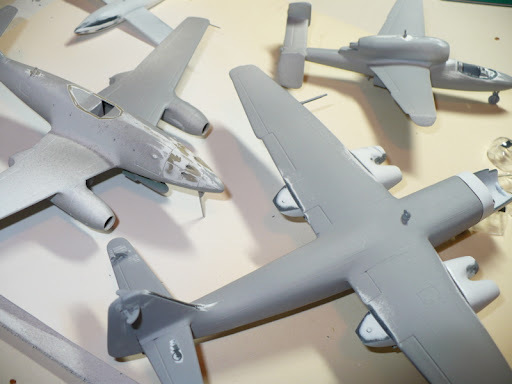 Now don't forget that these are all tiny, low-detail 1/72 scale models with inherently brittle old plastic - missing a few pieces - with parts snapping rather easily - so it is a bit of a fun break from the rigidly "perfect" 1/32 Hasegawa sort of build. 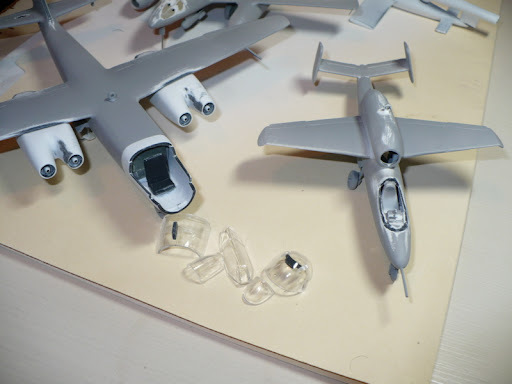 I am having a bunch of fun, replicating struts, gun barrels, and pitot tubes with staples and paper clips - it has been a pleasurable way to return to my "moggeling roots" while I re-acclimate myself to the hobby. My unfinished Panzer and miniature figure collection is envious of all the time I spend on the planes, now - they are barking orders at me to return posthaste!! I am fascinated that you can handle so many builds at the same time. My limit is about one ! By the way, where did the Airfix FW-190D-9 go? Or was it deemed "too good", I remember building it many years ago and it was a nice kit! 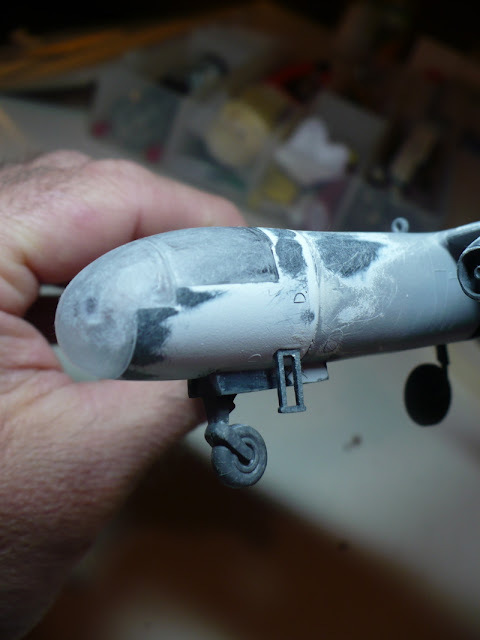 Here are a few pics of the "instant luftwaffe" today...still in glorious Tamiya primer!!! I've added a few pictures of the project - school has been in session for two weeks, but I have been able to get things closer to final painting and ultimate completion on the Ar 234 C, He 162, and Me 262. Thank you for your patience! The Badger 150 will be getting its day in the sun, I promise!!! 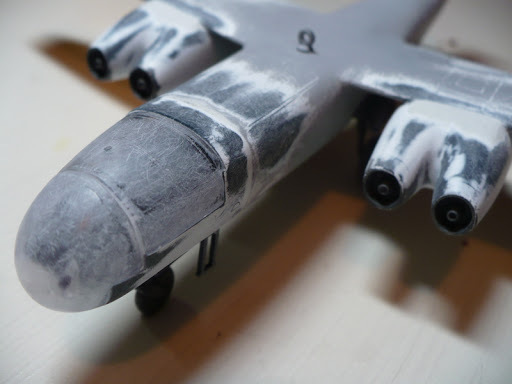 The Arado is going to be further modded into a nightfighter "fantasy" so I can have fun adding antennas to the nose. 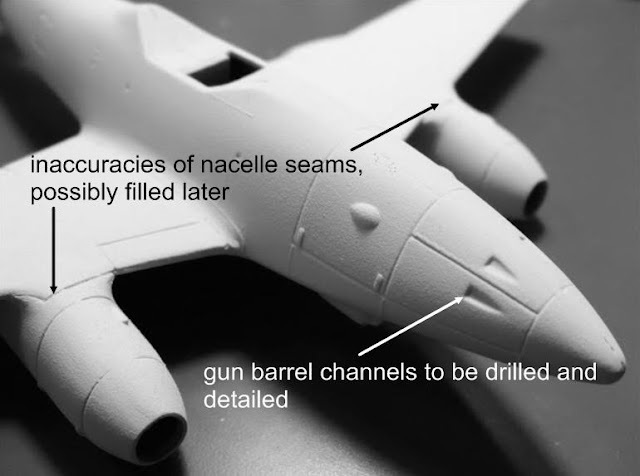 I also will be mocking up a gun nacelle for the belly. The Sturmvogel is just going to be as is; small details like radio wires and such (like I'll do for all of these oldies) but that's about it. 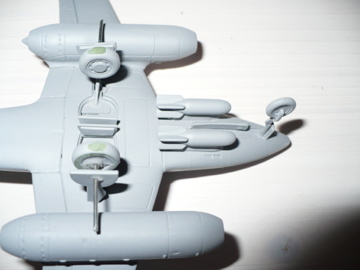 The Heinkel will be having its gun troughs drilled and tiny rods or tubes inserted to mimic a pair of cannon. Thanks! Now, it's back to school!!!!! 1. Me262 A-1a has fully "morphed" into an ordnance-laden Sturmvogel. Still have work to be done; I'll add more detail on this later. Suffice to say, this 30-40 year-old plastic sure likes to snap and break! Love the brittle "oleo"! 2. 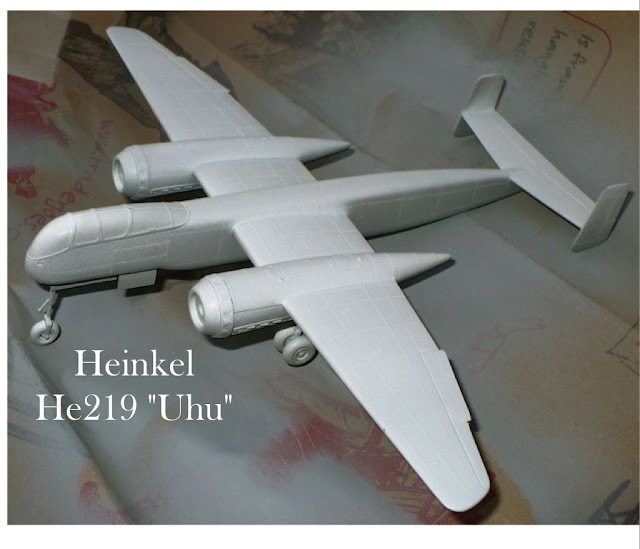 The He162 is just about ready to be painted. Going to scratchbuild some guns for the fuselage, etc. 3. 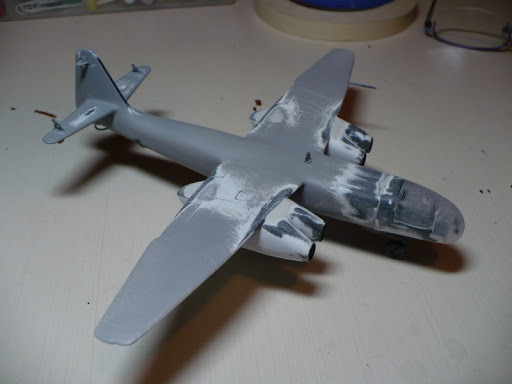 My 4-engined Arado 234 C2 is coming along. Had to waste a good bit of time scratching up landing gear, etc due to brittle tiny parts snappin'. This has been a fun old kit to build up. 4. The V-1 has required very little care; ideally I would like to depict this laying on a dusty hangar floor or something like that. Finally, I will get back to inserting comments within my jpegs once I get my work PC back to me - I only have SMART Notebook loaded on that particular machine. Enjoy the old-school, old-guy plastic disasters! Ben, thanks for asking! I am back from vacation and have not been online in a while. I did snap some more images of the Volksjaeger and the Sturmvogel "in process" - I will get more pics and info soon. Things are getting busy for me - school starts soon, and I get a new batch of 4th graders to manage! Hope that some are interested in military models! ..you picked some real golden oldies to work with there Adam...good work so far, can't wait to see some more! How's progress on these going? 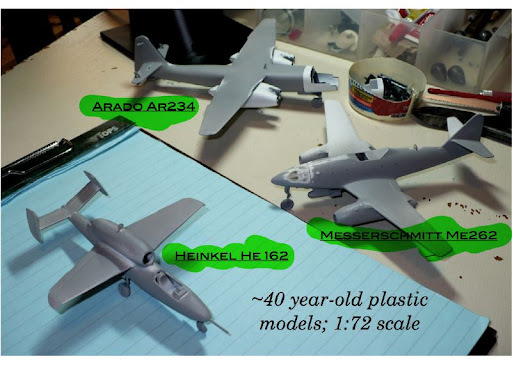 The two Heller kits are still among my favourites, the 262 looks very good shapewise when finished and the Me-163 includes the "schlepper" as a bonus. I am very fond of those old boxes, I have a bunch of them myself. I see that your primer coats look a bit pebbly: one thing that helps a lot is heating the can before spraying. Use warm tap water (NOT boiling water and certainly not any other heat sources, just warm tap water!) This raises the pressure (potentially dangerous if it gets too hot but tap water shouldn't cause any problem), makes the paint thinner and it will settle a lot better on your model! Good luck, I've bookmarked your thread! 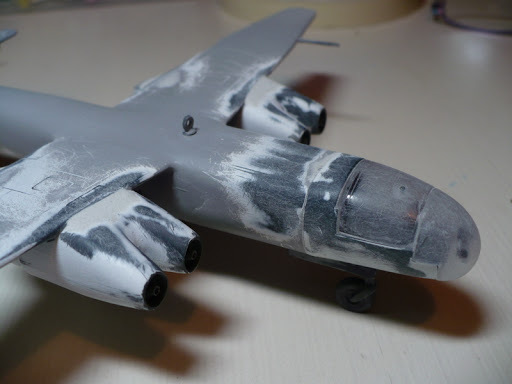 Some progress on the Arado 234 to show - smoothing and sanding prior to priming. 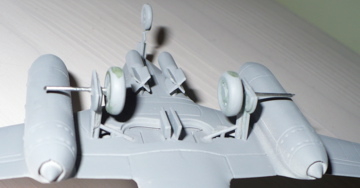 I assembled both the Junkers 004 and the twin BMW 003 engine nacelles since I am still unsure whether this will be a 234B or 234C in final form. Some nice progress on these kits of yours. You're welcome to include one in the Luftwaffe 1946 campaign we're running. 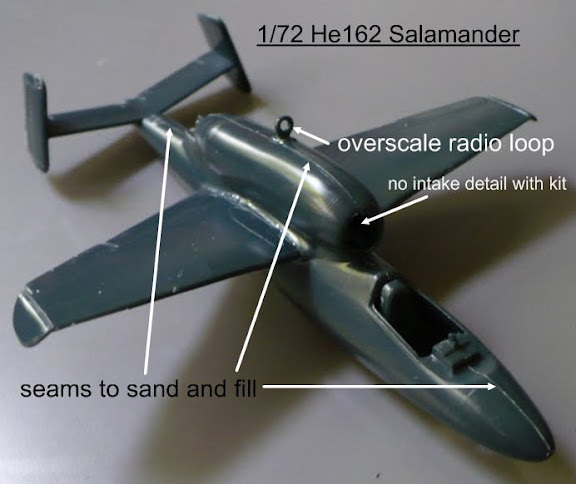 I got a bit of a start on the Arado Blitz while the Salamander was drying off - those are CA glue "strips" on the fuselage and wing root seams - and the "parts box" pic reflects my tendency to build EVERYTHING that comes with a kit. 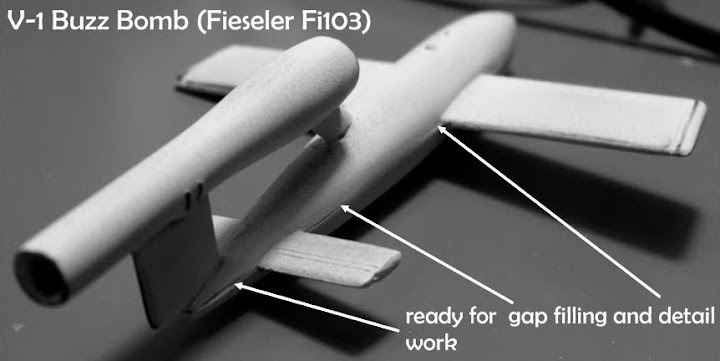 Still unsure whether this will be a 234B or 234C model, I like the looks of both...and the way Frog designed this kit, you can fit either the B or C cockpit & canopy as an assembly and also alternate between hanging the single-engine or twin-engine nacelles under the wings. Oh well - it's fun to think about, anyway! Looks like you've got a lot of work, and also a lot of fun there! As all these aircraft are late war, have you thought of trying to find a base where all these types were present and doing them in the correct markings for the aircraft stationed there? Ben, it's all good "clean" (relatively speaking!) and cheap fun for me, especially since these old 1/72 kits were priced right - I bought 6 at once and made some room off the shelves for new stuff! You bring up a great point as far as "period depiction" is concerned - these are indeed all later-war pieces, and I have been scratching my noggin a bit deciding how to set them up. One thing that very quickly came to mind, especially after reviewing my Luftwaffe book collection and online references, was possibly clustering several together in one sort of "abandoned hangar" diorama as might have happened during the Allied advances in the spring of '45. Also, those images of derelict and piled-up craft awaiting the cutter's torch and the scrapyard intrigues me as well. Not so sure if it would truly be possible to have seen many of these together in actual combat or field conditions, though - the Ar234 bombers and He219 night fighters didn't fly in the same groups and so on. 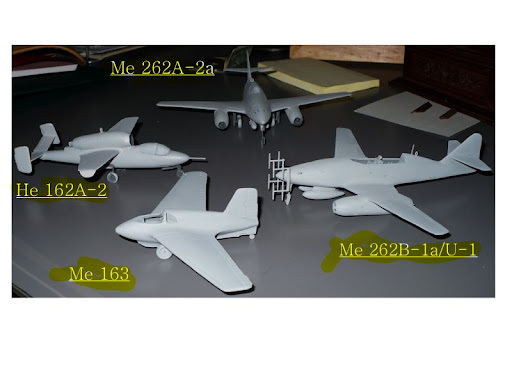 The main thing is that whatever I do with these tiny birds, I plan on trying to do a fair job of representing "likely" variants as far as paint schemes and unit markings are concerned. Here's a few of the books I like to go through for inspiration - you might even have them in your bookshelf! 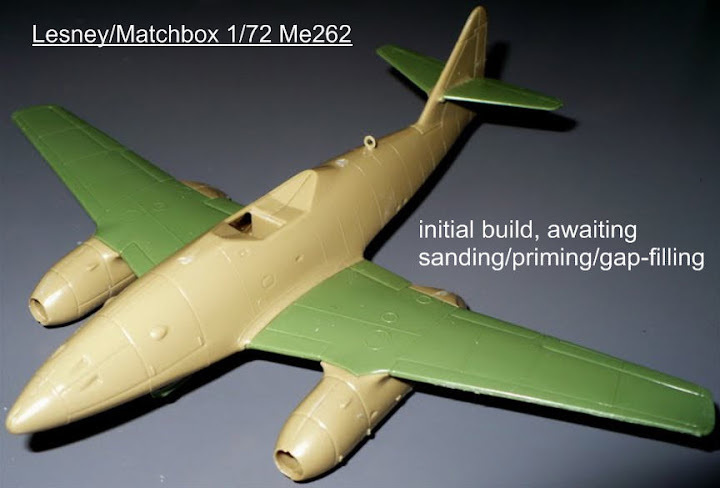 I was able to spend some time on the single-seat Me262 (old Lesney/Matchbox kit) which I've decided to build as a Sturmvogel/bomber - just added the Wikingerschiff beneath the nose, basically! Came with the kit as an option. Built the bombs as well; haven't yet smoothed & primed them though. I like using the Games Workshop primer, it fills gaps well and takes easily to wet sanding with the 320 grit foam bits I've been using. I had both "skull white" and black; ran out of the black so this effort just happens to be done in white primer. I will be updating and replacing the pics when I have some time to edit them at home. Hello all! This is my very first attempt at any sort of build log (blog) as I have only recently gotten back into the mil mod hobby. While there will be very little (if any) PE, Micro-Sol, advanced techniques, or hyper-detailing involved - this will be (hopefully) a fun effort to get in some much needed practice! I am calling this my "instant Luftwaffe" blog as a bit of a pun on myself - this oddly assorted pile of old 1/72 kits was discovered by me on vacation in New Hampshire. A wonderful Swiss gentleman, who owns and operates an incredible train hobby store in the Mt. Washington Valley, had several of these very old original Heller/Frog/Lindberg/Lesney kits and I snatched up 6 of them! 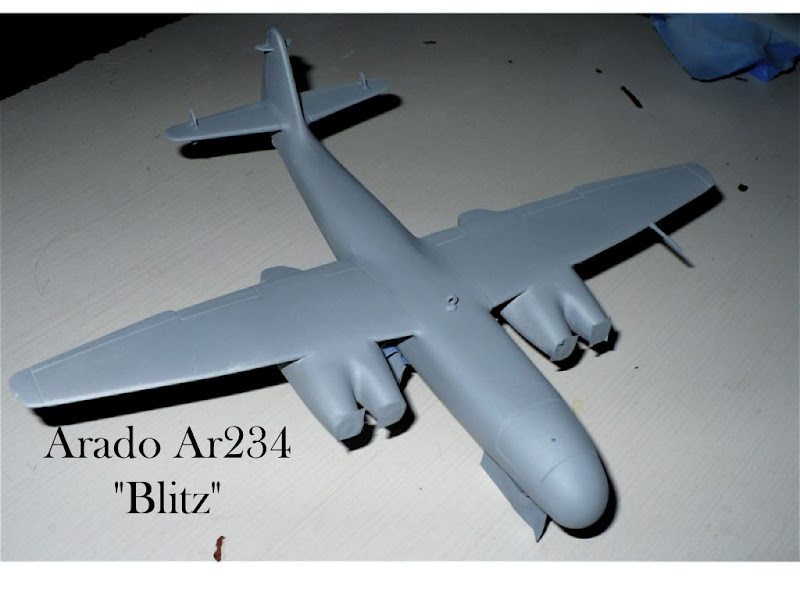 Frog Arado Ar234 Blitz; comes with Fieseler Fi103, Frog He162 Salamander, Lesney/Matchbox Me262A-1a, Heller Me262B-1a/U-1, Heller Me163 Komet, Lindberg He219 Nachtjaeger, all from '68-74 era. 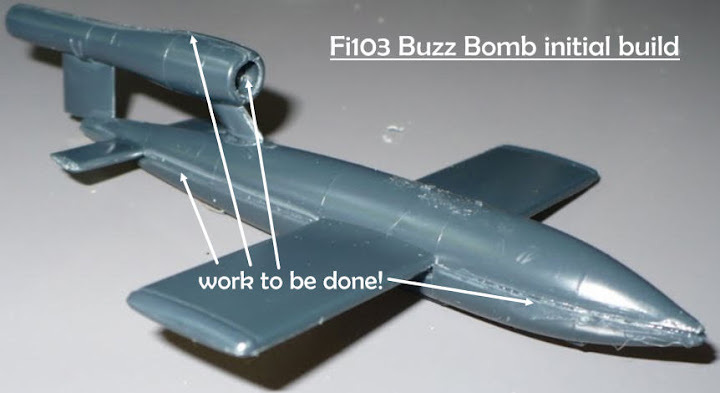 I quickly cobbled together the He162 and Fi103, just love those cruddy initial pics prior to sanding/primer/etc! I'll try and update best I can - for me, I'm mainly trying to just enjoy myself and will primarily focus on prep-work for final painting rather than scratchbuilding much on these. However, who knows? And I'm really looking forward to getting some use out of my airbrush!